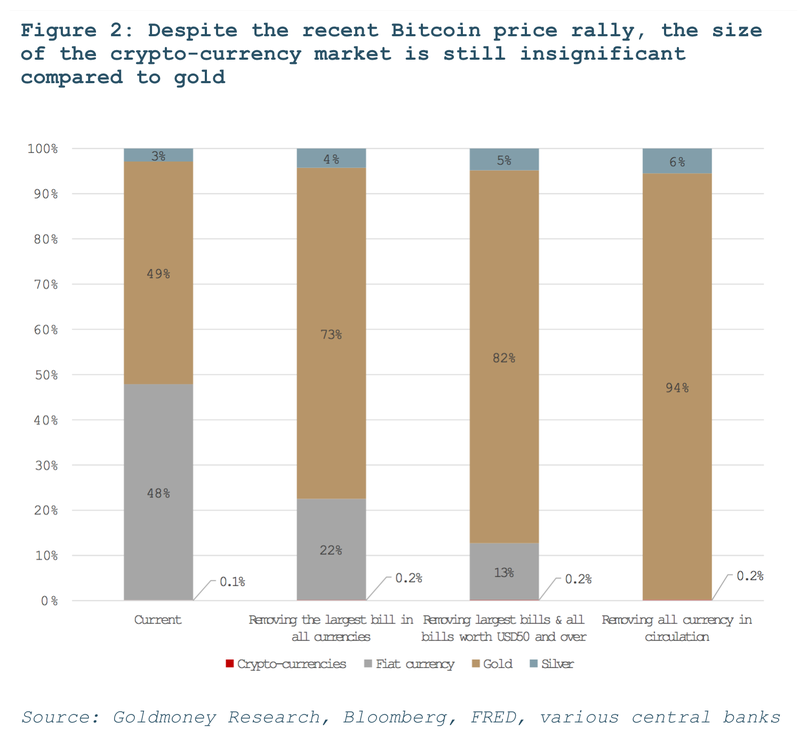 Is A Bitcoin "As Good As Gold"? At the helm of the Trends Research Institute, Gerald Celente returns with holiday spirit still intact. He's concerned by terms like "Nationalism / Populism" that discredit what the PTB are attempting to hide: global contempt for a broken system. Peter Grandich of Peter Grandich and Company says the recent correction has cleared the skittish, speculative crowd, presenting a valuation opportunity. In 2016, the PM sector performed solidly - silver added 14%, gold 10% and the XAU gold / silver shares advanced over 63%. The gold price was under a bit of selling pressure during the Far East trading session on Friday. That lasted until the London open — and then it rallied back towards unchanged. That rally, such as it was, got cut off at the knees at precisely 11:00 a.m. GMT in London. From there it chopped lower until the low tick of the day was placed around 2 p.m. EST in the thinly-traded after-hours market in New York. It inched quietly higher from there into the close. Gold gained a respectable 1.88% this past week and is coming off lows, but as I mentioned, I remain sceptical. Solid action though since moving past $1,160 but gold is backing off the major $1,180 pivot area for now. I'd really need to see a nice move past $1,180 then acceleration and strong volume on a move past $1,200 to get me excited, and this would have to continue into the Chinese New Year which begins on January 27th. With the Dow Jones rising excruciatingly close, or within 0.37 points of 20,000 on Friday only to let down the market cheerleaders in the last minute, it would appear that there is nothing one can throw at a market which is determined to keep rising no matter what happens in the world. So leave it to our favorite skeptic, Citi's Matt King to throw a fly in the ointment by asking how is it possible that "nothing sticks to markets." As King then notes, earnings bullishness gets you only so far, and as the chart below shows, the recent surge in global stock prices is not a function of earnings, but expanding P/E multiples relative to Trasuries, which then prompts him to ask why, now that yields are surging, "shouldn't we be discounting using higher bond yields." This is turn prompts King to propose one of his trademark rhetorical questions: "There Is something strange going on" adding that "something doesn't smell right" in a world in which uncertainty is soaring yet spreads are collapsing, as SocGen first pointed out last month in its "most frightening credit chart", even as leverage also keeps rising. What is the "key ingredient" in the mix that makes sense out of this market chaos? Simple: according to King, central bank buying of anything that is not nailed down is the "missing link." Which in turn has - so far - allowed markets to ignore the reality that the credit bubble is getting bigger by the day as debt and interest coverage continue to rise while EBITDA still shrinks, resulting in late cycle fundamentals and valuations. And yet, there is always a tipping point: according to King, such a point would arrive once real yields spike higher "not matched by a pick-up in growth." His final rhetorical question: how long until this tipping point happens? The answer: 50 basis points. Now if only a 50 basis point spike in real yields would also put an end to all the other "strange things" taking place in a world which is burning every day, yet where the Dow Jones is partying like it's 19,999. Looking at events over the past few years, one wonders if our own society is experiencing the same phenomenon. A contrast with what economic policy-makers term “normalisation” is instructive. Normalisation is what has historically happened in the wake of financial crises. During the booms that precede busts, low interest rates encourage people to make investments with borrowed money. However, even after all of the prudent investment opportunities have been taken, people continue borrowing to invest in projects and ideas that are unlikely to ever generate profits. Eventually, the precariousness of some of these later investments becomes apparent. Those that arrive at this realization early sell up, settle their debts and pocket profits, but their selling often triggers a rush for the exits that bankrupts companies and individuals and, in many cases, the banks which lent to them. In the normalisation which follows (usually held during ‘special’ bank holidays) auditors and accountants go through financial records and decide which companies and individuals are insolvent (and should therefore go bankrupt) and which are merely illiquid (and therefore eligible for additional loans, pledged against good collateral). In a similar fashion, central bank officials decide which banks are to close and which are to remain open. Lenders made freshly aware of bankruptcy risk raise (or normalise) interest rates and in so doing complete the process of clearing bad debt out of the system. Overall, reality replaces wishful thinking. While this process is by no means pleasant for the people involved, from a societal standpoint bankruptcy and higher interest rates are necessary to keep businesses focused on profitable investment, banks focused on prudent lending and overall debt levels manageable. By contrast, the responses of policy-makers to 2008’s financial crisis suggest the psychology of hypernormalisation. Quantitative easing (also known as money printing) and interest rate suppression (to zero percent and, in Europe, negative interest rates) are not working and will never result in sustained increases in productivity, income and employment. However, as our leaders are unable to consider alternative policy solutions, they have to pretend that they are working. To understand why our leaders are unable to consider alternative policy solutions such as interest rate normalization and banking reform one only needs to understand that while such policies would lay the groundwork for a sustained recovery, they would also expose many of the world’s biggest banks as insolvent. As the financial sector is a powerful constituency (and a generous donor to political campaigns) the banks get the free money they need, even if such policies harm society as a whole. As we live in a democratic society, it is necessary for our leaders to convince us that there are no other solutions and that the monetary policy fixes of the past 8 years have been effective and have done no harm. Statistical chicanery has helped understate unemployment and inflation while global cooperation has served to obscure the currency depreciation and loss of confidence in paper money (as opposed to ‘hard money’ such as gold and silver) that are to be expected from rampant money printing. Looking at unemployment figures first, while the unemployment rate is currently very low, the number of Americans of working age not in the labour force is currently at an all-time high of over 95 million people. Discouraged workers who stop looking for work are no longer classified as unemployed but instead become economically inactive, but clearly many of these people really should be counted as unemployed. Similarly, while government statistical agencies record inflation rates of between one and two percent, measures that use methodologies used in the past (such as John Williams’ Shadowstats measures) show consumer prices rising at annual rates of 6 to 8 percent. In addition, many people have noticed what has been termed ‘shrinkflation’, where prices remain the same even as package sizes shrink. A common example is bacon, which used to be sold by the pound but which is now commonly sold in 12 ounce slabs. Meanwhile central banks have coordinated their money printing to ensure that no major currency (the dollar, the yen, the euro or the Chinese renminbi) depreciates noticeably against the others for a sustained period of time. Further, since gold hit a peak of over $1900 per ounce in 2011, central banks have worked hard to keep the gold price suppressed through the futures market. On more than a few occasions, contracts for many months worth of global gold production have been sold in a matter of a few minutes, with predictable consequences for the gold price. At all costs, people’s confidence in and acceptance of the paper (or, more commonly, electronic) money issued by central banks must be maintained. Despite these efforts people nonetheless sense that something is wrong. The Brexit vote and the election of Donald Trump to the White House represent to a large degree a rejection of the fake reality propagated by the policymaking elite. Increasingly, people recognize that a financial system dependent upon zero percent interest rates is not sustainable and are responding by taking their money out of the banks in favour of holding cash or other forms of wealth. In the face of such understanding and resistance, governments are showing themselves willing to use coercion to enforce acceptance of their fake reality. The recent fuss over ‘fake news’ seems intended to remove alternative news and information sources from a population that, alarmingly for those in charge, is both ever-more aware that the system is not working and less and less willing to pretend that it is. Just this month U.S. President Barack Obama signed the Countering Disinformation and Propaganda Act into law. United States, meet your Ministry of Truth. Meanwhile, in India last month, people were told that the highest denomination bills in common circulation would be ‘demonetized’ or made worthless as of December 30th. People were allowed to deposit or exchange a certain quantity of the demonetized bills in banks but many people who had accumulated their savings in rupee notes (often the poor who did not have bank accounts) have been ruined. Ostensibly, this demonetization policy was aimed at curbing corruption and terrorism, but it is fairly obvious that its real objective was to force people into the banking system and electronic money. Unsurprisingly, the demonetization drive was accompanied by limits on the quantity of gold people are allowed to hold. Despite such attempts to influence our thinking and our behaviour, we don’t need to resign ourselves to pretending that our system is working when it so clearly isn’t. Looking at the eventual fate of the Soviet Union, it should be clear that the sooner we abandon the drift towards hypernormalisation and start on the path to normalisation the better off we will be. 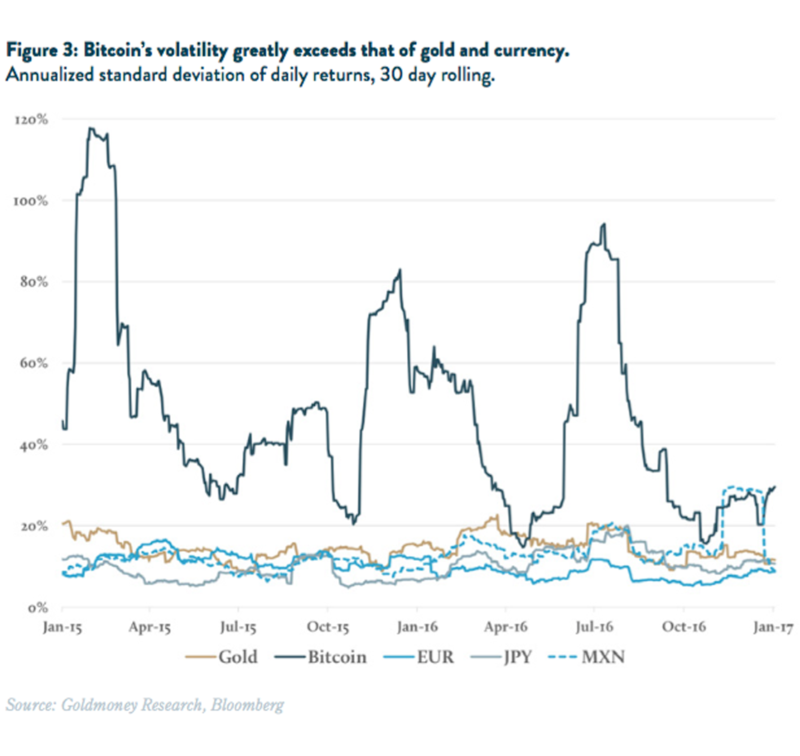 The price of Bitcoin seems to have exceeded the price of gold briefly for the first time this week; however, this comparison is completely arbitrary. The same basic principle applies to money. Combined above-ground gold stocks are currently worth around $7 trillion. As we noted last year, that is more than all banknotes in circulation of all currencies combined (see Eliminating cash will also eliminate the checks and balances on banking policy and practice, February 22, 2016), and it certainly dwarfs the market cap of Bitcoin at around $18 billion. In fact, all crypto-currencies combined (we count 710) have a market cap of just $21 billion (see Figure 2). Hence, instead of measuring volatility as standard deviation, we can measure just the downside deviation. This provides a better idea of the risks of money. How does this look for Bitcoin? 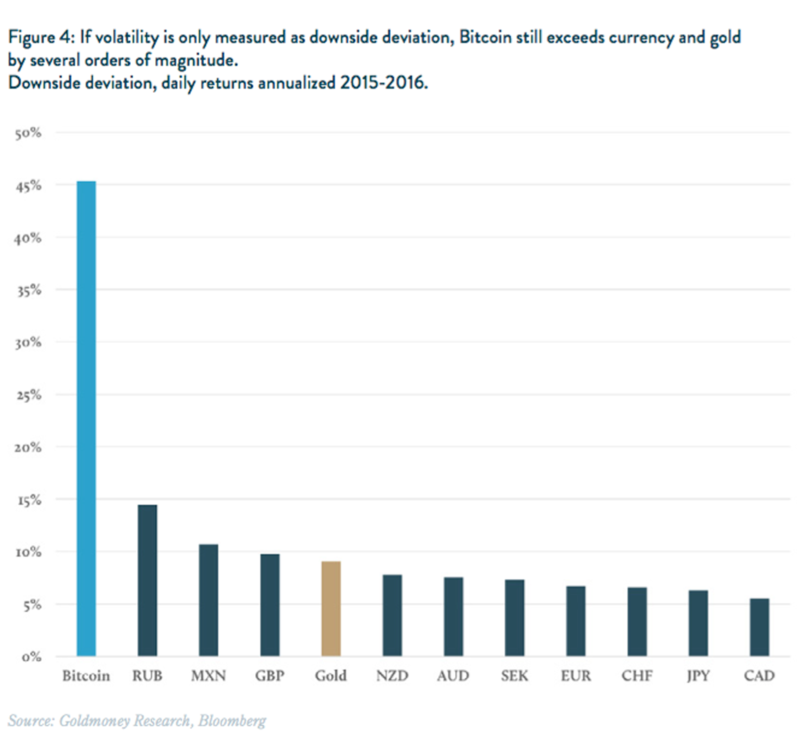 Bitcoin’s downside deviation is still several orders of magnitude higher than that of gold or currency. Over the past two years, Bitcoin experienced a downside deviation of >45%. Since the beginning of data in 2010, it was >100%. India's weekly news magazine Outlook today offers a fascinating interview with Somasundaram PR, managing director of the World Gold Council's Indian office, noting that despite recent suggestions to the contrary, there is really no limit in law or regulation on how much gold Indians can own. The interview also details how Indians consider gold just as much a currency as any other and treat it that way in everyday business transactions. -- it's hard to imagine any practical measures by which the government will separate people from their gold. Stephen McBride writes: Since reaching multi-year highs in July, gold has plummeted 17%. Having risen 22% in the first seven months of 2016, many believed the yellow metal had moved too far, too fast. They were right. Gold’s fall quickened post-election, caused by an uptick in optimism about America’s future. The economy was seen as ready to “take-off” in 2017 once Trump’s pro-growth policies kicked in. The Fed’s December rate hike just added fuel to the fire. Many people who have been steady loyal dedicated even honorable investors in the gold & silver trade as personal protection for life savings have endured struggles with the family and friends. Whether the conversations are with dullards or stubborn types, maybe educated and formerly successful types, maybe those who are stuck in the paper world of shuffled investments of seemingly no basis, it is of no matter. The battle has been for a few years to convince those around us that a deep contracted crisis is underway. The battle has been to convince that a paradigm shift is in progress. The battle to convince family, friends, colleagues, neighbors, and acquaintances that the financial and economic system is facing a profound risk of total breakdown has been difficult. Most people are stuck in their own cocoon with family duties and business responsibilities, to be sure. Many people are also stuck within entrenched assumptions, most of which are false and easily dismissed. Many people simply do not care, since the official thermometer and barometer readings all read normal if not healthy signals, but then again they are rigged much like icing a thermometer from a rabidly sick man with a high fever. No resolution to certain pervasive intractable problems can come easily, not without a tumultuous sequence of events. The climax appears to have begun last year, while the breakdown accelerates. Investors can profit in resources, says Lior Gantz, editor of Wealth Research Group, by partnering with and investing like the big players in the field. The natural resource industry is a maze of companies—thousands of them—but when you get right down to it, this entire sector is 95% made up of average businessman and a small and tight-knit group of top dogs. The gold miners’ stocks are rocketing higher again after suffering a rough few months. Following sharp selloffs on gold-futures stops being run, the Trumphoria stock-market surge, and a more-hawkish-than-expected Fed, this battered sector had largely been left for dead. But gold stocks’ strong fundamentals finally overcame the dismal herd sentiment last week, paving the way for this sector to shine again in 2017. This “shine again” assertion likely seems dubious to casual observers, since the gold miners’ stocks suffered a miserable Q4’16. The leading HUI NYSE Arca Gold BUGS Index plunged 21.1% in a quarter where the benchmark S&P 500 broad-market stock index surged 3.3%. Naturally gold miners’ profits are fully dependent on gold prices, and this metal fell 12.7% in Q4 which proved one of its worst quarters ever.